November 23, 2019 will be the 50th Anniversary of the Schoenstatt Apostolic Movement in the Archdiocese of San Antonio. In gratitude to God, to our Mother Thrice Admirable, and to our father and founder, Fr. Joseph Kentenich, we honor our history and the thread of the Covenant of Love that is woven throughout. Foundation: The arrival of the Schoenstatt Sisters of Mary to San Antonio on August 21, 1961. Four sisters came to teach at St. Lawrence Catholic School: Sr. Anne Mary, Sr. M. Annerosa, Sr. M. Antoinette, and Sr. M. Renata. The sisters resided in St. Lawrence Parish on Petaluma Street from August 21, 1961-December 18, 1988, offering 27 years of dedicated service to the Archdiocese of San Antonio and the Schoenstatt Movement. Other Schoenstatt Sisters that also served in San Antonio during the years above, were Sr. M. Margret, Sr. M. Ludhelma, Sr. M. Hildegard, Sr. M. Carmen and Sr. M. Gwendolyn. The first Schoenstatt Father, sent by Fr. Kentenich in 1967 to work in Texas, was Fr. Peter Locher. He made frequent visits to the Schoenstatt Family in San Antonio during his three-year assignment. 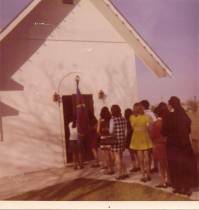 On November 23, 1969, the first shrine in San Antonio was dedicated in the parish of St. Lawrence (which was celebrating its 10th anniversary on that day.) 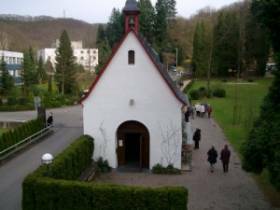 The shrine was built by the loving hands and hearts of the first Schoenstatt members. In the dedication prayer, we read . . . “But most of all we give you our hearts. Take and receive them, form and mold them, dear Mother, in the fire of your love. Burn out of them what burdens and hinders them. . . . Unite them with your heart . . .” The original intention (idea) of the shrine was to unite the parish. On this day of dedication, four couples sealed the covenant of love. Thus, this date also marks the 50th Anniversary of the Schoenstatt Family League in the Archdiocese of San Antonio. The idea of unity of the young Schoenstatt Family was to become its ideal. With the abundant grace of a loving Father from the shrine, the young Schoenstatt Family made efforts to realize its ideal through its lived covenant of love, many contributions to the capital of grace, and with the education of a beloved thrice admirable Mother and Queen. In Spring 1969, the groundbreaking and the offering of the foundation stone for the shrine was held. At this time, April 1969, it happened that the Father Eye symbol was on international pilgrimage (after the death of Fr. Kentenich on September 15, 1968) and visited in Texas including San Antonio. Father came to us at the time of the groundbreaking for the Schoenstatt Shrine of Unity in San Antonio -- a true blessing! Was this a confirmation for a future daughter shrine in our archdiocese? This writer believed this at the moment of grace of sealing the covenant of love, together with my husband, Julian, in 1988 and believes it today, as is attested by the holy history of the Schoenstatt Family of the Archdiocese of San Antonio. Join us in this great experience in the Holy Land, where Sacred Scriptures come alive as we walk the path Jesus walked. Feel the beautiful March weather, admire the inspiring scenery and reflect on God's Word. Come along for this Catholic Holy Land pilgrimage that will enhance your faith to appreciate it even more…. The 2017 October Day Celebration of the Texas Family was held at the Cor Unum in Patre Shrine, Mount Schoenstatt on Sunday, October 22. Our Heavenly Father provided us with a beautiful sunny day for our family celebration. Schoenstatt family and friends from six dioceses came on pilgrimage to visit our Mother Thrice Admirable and to celebrate as one family united in the heart of the Father and in the heart of our Father and Founder, Fr. Joseph Kentenich. The guardians of the shrine enthusiastically welcomed the pilgrims. The Schoenstatt Family from the Laredo Diocese arrived by charter bus. We were so blessed to have three Schoenstatt Fathers and seven Schoenstatt Sisters join the Texas Family for the day! The morning program began with a serenade for our Mother and Queen and a truly beautiful opening prayer expressing thanks to our Heavenly Father for a new day to be cor unum in Patre – one heart in his own fatherly and triune heart. Fr. Patricio Rodriguez, state director, was the main celebrant for the Holy Mass in the Cor Unum in Patre Shrine and its forecourt, which is nestled in the shady oak trees. Fathers Christian Christensen and Johnson Nellissery were concelebrants in the Mass. All came prepared for a picnic lunch on the grounds of Mount Schoenstatt. Sr. M. Mara Medina organized children’s games and activities. A media presentation by Sr. M. Heidi Infante: “Impulse for the Father Kentenich Year” was shown in the Community Center. It emphasized several points referring to our founder’s charism – how we must keep it alive to shape the future of the Church and society – it must become alive in us! His charism is a gift and a task, it is a mission – it is a mission also meant for us. A Witness Panel was next on the program. Sr. M. Danielle Peters introduced the presenters who shared about their experiences with Fr. Kentenich. Fr. Christian Christensen shared about his encounter with the Founder and described him, in a profound way, with three words, “a fine man.” Sr. M. Erlinda Pimo was in Germany when a novice (1966-68) and experienced Fr. Kentenich as someone who had time for everyone and who gave each person he talked to his full attention. She shared that he received many gifts from his visitors and would share the gifts with others, including herself, and gave the persons to choose from the gifts he had received what they would like to have. Carlos Cantu shared a very special answered prayer. 41 years earlier, his wife was pregnant for the 5th time. It appeared that something might be wrong and the doctor suggested a therapeutic abortion. In unison, the Cantus said no! They turned to Father Kentenich and entrusted the pregnancy to him. All went well and their only son was born, a healthy baby boy who is now 41 years old. In gratitude for the answered prayer, the child was named Jose Carlos. The Cantus are the parents of five daughters and one son. They are expecting their 9th grandchild. Several of their children also turn to Father Kentenich in prayer. One daughter also entrusted her pregnancy to Father Kentenich. In gratitude, she named her child Josef. So, Cantu urges everyone to entrust their needs to Father Kentenich, write them down and make them known, especially in this Father Kentenich Year. It was such a special gift to hear the presenters’ words that brought the presence of our Founder so near to us. The beautiful day ended at the Shrine with a closing prayer and renewal of our pledge: “Yes, Father, we go with you!” Together we recited the Prayer for the Father Kentenich Year. Holding hands in the expansive unity ring around the shrine, we raised our voices to renew our consecration, “My Queen, my Mother …” One by one, we all went up to lovingly sign our name on a red poster board heart that symbolized the heart of our Father and Founder. Fr. Patricio walked into the shrine with the heart filled with all our names and placed it on the altar. With this closing act of our celebration, our Texas Schoenstatt Family expressed our gratitude to God for the gift of our Father and Founder -- particularly his “fatherhood” – from which stems the love we have for him. Fr P. Juan Pablo Catoggio asked schoenstatt.org editorial staff to help spread his letter, written in the name of the General Presidency, proclaiming a “Father Kentenich Year” in preparation of the 50th anniversary of his death. The idea is to share this letter, at Pentecost, with the entire Schoenstatt Family. Already on Friday, June 2, all National Presidencies and Centrals of the Schoenstatt Movement received the letter. We publish here the official English translation of the letter that is also available in Spanish and German. The members of the General Presidium send you heartfelt greetings from Schoenstatt on the feast of Pentecost. Here, at the place of grace and of our origin, we implore for you all over the world the gifts of the Holy Spirit on the occasion of his feast. In 2018, we celebrate the 50th anniversary of the death of our father and founder, Father Josef Kentenich. After consulting the representatives of the movement worldwide, we invite you to a Father-Kentenich-Year starting on September 15, 2017 and ending on the 50th anniversary of his passing away on the 15th of September 2018. Let us focus on our father and founder for one year: on his thinking and message, on his interesting and varied biography, and on the answers he has given to the challenges of the Church and the world and still wants to give through us today. This year gives us the opportunity to deepen our relationship with Father Kentenich, so that his charism can be reawakened in us. Let us invite many people to meet Father Joseph Kentenich for the first time or to rediscover him as a prophet of our time! Father Johnson Nellissery, Schoenstatt Father, is taking a group of pilgrims to Greece and Turkey, September 30-October 10, 2017. You are invited to consider this opportunity to follow the footsteps of St. Paul. 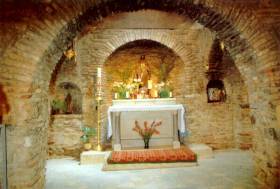 Saint John was asked by Jesus to care for His Mother, so St. John took her to Ephesus where he built a hut for Mary until her last days on earth. Blessed (Sister) Catherine Emmerich (1774­1824) was a mystic and visionary who described the location of the hut. In 1896 this site was declared a Shrine of the Roman Catholic Church. Here miracles have been recorded and an apparition of Mary has been documented. Many popes, including Pope Benedict XVI, have visited and celebrated Mass at the site. Now our own Schoenstatt Father Johnson will celebrate Mass there, as part of our pilgrimage to Greece and Turkey as we follow St. Paul’s Footsteps. There’s still time to join us! If you are at all interested, please come to our Greece Pilgrimage Meeting to be held on Saturday, July 22, 6:15 PM in Grace Hall at Saint Paul Catholic Church in South Austin (after the 5 PM Mass). Or for more information about the pilgrimage, contact Gina Rollman at ginarollman65@gmail.com. Queen of three graces on the move! Dear State Team Members and invited guests, once more welcome to our Confidentia Shrine! This is a very special year since our Shrine was nominated to be a “HOLY DOOR OF MERCY”. We are happy for each group that comes to the Shrine and is able to receive the Plenary Indulgence. It is special too because we are on our Crowning Path. As we know since last year at the end of our June convention in 2015, the crowning path was opened. As Schoenstatt Rosary Campaign in the USA and Canada, we are spiritually moving across the different states from West to East: Oregon, Texas, Louisiana, stopping in Florida, Ohio, even New York, ending in Wisconsin. Why do we do this spiritual Crowning Path? After the centennial celebrations in the year 2014, and all the blessings received, we feel compelled to crown the Blessed Mother. We want to crown her in thanksgiving, for all graces and blessings she has bestowed upon her Schoenstatt Work and on each individual person consecrated to her during the past hundred years. As members of the Schoenstatt Rosary Campaign State Team, we have experienced countless graces of inner transformation in families, and individuals. Each visit the Blessed Mother has done is different, she bestows her graces according to the needs of the people. Sometimes some members in a family are indifferent at the beginning of her visit, but after some time they open themselves for her love and care. Through the Schoenstatt Rosary Campaign, we have seen how she visits the people working the same miracles as she did on her visit to her cousin Elizabeth. The Schoenstatt Rosary Campaign groups have experienced the grace of home; they feel accepted by her motherly care. They get closer to God and receive again the sacraments. And with this crowning we prepare her crowning with all our people. We want to crown her in our dioceses, parishes, groups, homes. Each image of the Pilgrim Mother should be crowned on October 22 or 23 this year 2016. No image of the Pilgrim Mother should be left uncrowned. We want to take this responsibility with us. So this weekend we prepare ourselves for the upcoming crowning. She is the great missionary. She will work miracles! Each altar where we place the Pilgrim Mother be it in our homes, parishes, schools, nursing homes or places of work is the throne from where the MTA wants to bend down to us as Queen and Mother and in her love extend to everyone her three graces from the Shrine. We are her instruments, who make this possible! As we go through our Crowning Path, we will pray to our Mother and Queen, that she grants us the grace to be always her willing instruments in leading others into her heart as children so they receive: the grace of being at home; to lead others to a greater openness for education of our Mother and Queen: the grace of inner transformation; and to make others aware of their missionary character through a more intentional apostolate with the Pilgrim Mother: the grace of apostolic fruitfulness. Practically we continue offering each Rosary and each apostolic deed as our conscious contribution for her crowning. And we continue with our groups, marking our Crowning Path, from the Tabor Shrine till we reach the Shrine in Milwaukee. The distance is 5,474 miles. The Rosary is our transportation. Every 15 Rosaries prayed, moves us together with John Pozzobon 250 miles to our destination: The International Shrine in Milwaukee. Why 15 rosaries? Because John Pozzobon used to pray before he died 15 rosaries every day! So in union with him we walk to the International Shrine in Milwaukee. We have them in Spanish and English. So let us go Ablaze with the fire of Pentecost. We want to deepen and to share the fruits of the Exile Legacy and to extend the mission of the Rosary Campaign, growing in love, unity and sanctity in our daily life. Here we have a poster of: OUR CROWNING PATH, please make one it helps. This Idea I took from in San Antonio, I saw it and I was inspired. I think it is very good. We can help each other by sharing ideas and let ourselves be complemented and enriched by the others.